It's June, it's hot and it's busy. We are definitely at our busiest in June as it is when all of our work with the breeding seabirds needs to be done. We need to try and do two complete all island counts of cliff nesting seabirds and as you can see some of the areas are big, and full of birds. The Amos, 2,380 Guillemots etc. The Wick, 3,284 Guillemots etc. 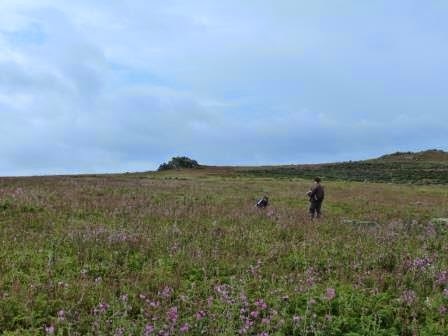 There is also a shearwater census in progress with teams of people out counting the number of responses to tape recordings of the males calls played down burrows in selected plots. There is also so much more going on besides with fascinating research projects looking at the lives of shearwaters, from burrow preference to their navigation abilities. If you visit in June, feel free to ask a member of staff about the work that is going on here.